These are incredibly cool cupcakes and everyone gets terribly impressed when I make them. I’ve been known to make cupcakes for silly reasons- when someones car broke down, when I was on time for lectures 5 days in a row and when I’m in a bad mood and need to bang bowls around the kitchen. 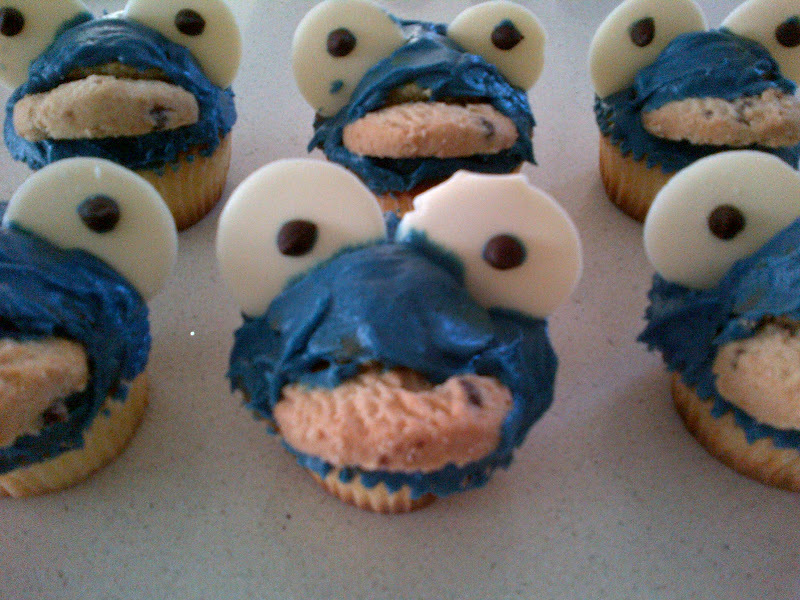 These guys are my ‘Cookie Monster’ cupcakes and everyone goes smiley when I make them. So I’m going to tell you how to make them- so you can make everyone go smiley. – Pack of white chocolate disks- you buy them in a box, and hope and pray there are at least 24 non-broken disks. If hoping and praying doesn’t work for you- I’d suggest buying two boxes. STEP ONE: bake a dozen vanilla cupcakes- if you don’t have a standby vanilla cupcake recipe I suggest you google one- vanilla cupcakes are very hard to mess up. Please note: chocolate cupcakes work just as well if they are to your fancy. STEP THREE: once they are room temperature you can start icing. To make the butter icing- beat the butter until light and fluffy, slowly add the icing sugar- then add the milk until smooth and combined. If you have a preferred butter icing- go ahead and use that. Once the icing is make- add the blue colour- LOTS and LOTS to get that amazing cookie monster blue. STEP FOUR: using a sharp knife cup smiles into the cupcakes where you want the cookie mouth to go. Holding the cupcake in your left hand- squish the mouth together so the cookie monster effectively opens his mouth. push the cookie in the open mouth- and push it in until there is a tight fit. Don’t worry about it not being perfect- you can cover any mistakes with bright blue icing. STEP FIVE: now the cookie is in place- generously cover the cupcake with the blue butter icing- remembering to ice underneath the biscuit. The icing should be able to hide any cookie assembling mistakes. STEP SIX: The eyes. Place a tiny dot of icing on the chocolate chip and stick this chocolate chip in the middle of the white chocolate disk. Push the two eyes into the cupcake near the top (where eyes should be) and wiggle them until the push slightly into the cupcake. 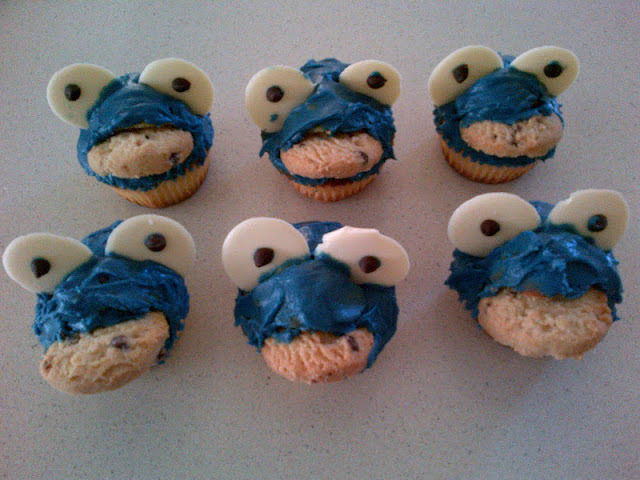 And VIOLA you have beautiful cookie monster cupcakes which are both a treat for your stomach and your eyes! The construction of the monsters sound a little complicated- but after messing up one or two it really becomes very easy- so play around with it a little until you get the desired result.